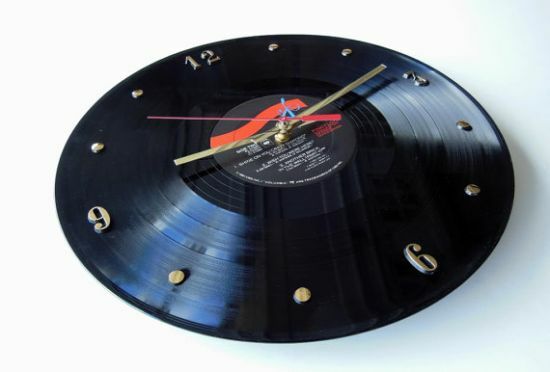 An old, repurposed vinyl record, at Etsy, now displays time to help you catch up with those fleeting moments. Turned into an arty timepiece, the Pink Floyd Record Clock flaunts metallic gold numbers, hour and minute hands. The second hand keeps ticking in sharp contrast with a metallic black, rounded record plate. The battery-powered clock keeps ticking thanks to the AA battery. Measuring approximately 12” in diameter, the Pink Floyd Record Clock has enough room to support American made quartz clock movement. The suppliers at RecordsAndStuff ship it anywhere in the world for an asking price of $19.00 USD. However, for the US and Canadian customers, the price tag reads $10.00 USD only. Though the ardent follower of the record album “A Collection of Great Dance Songs” may feel a bit depressed for it doesn’t play music anymore, they may still find solace from the fact that the derelict record has been reinstated with some life.